Soul-revealing X-ray eyes: The pain monster has found your weaknesses and deepest fears and it has driven its claws into those tender spots. But it doesn’t move an inch. Energy sucking fangs: The pain monster ist slowly but steadily draining your energy and robbing you of the things you enjoy. On certain days, its voracious thirst renders you almost paralyzed. Cape of invisibility: You beg for help, but despite its bone-crushing size and crippling dreadfulness, the pain monster remains invisible to others. Even close friends and family members tell you “it’s just in your head” or “just ignore it”. Those words render a big smile onto the pain monster’s face while you feel more and more alone and isolated. You start doubting your own sanity. Inexhaustible big-belly-battery: You keep throwing new medications and therapies at the pain monster, but it seems like you can’t harm it. After years of searching for the silver bullet, you consider giving up. Well, truth is, there is no silver bullet to defeat the pain monster. BUT DON’T GIVE UP, there is hope! 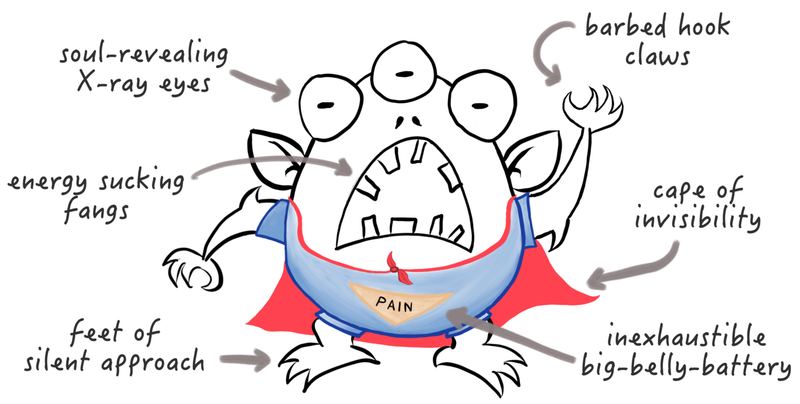 There are ways to gain control over the pain monster and in some cases it is even possible to defeat it entirely. After years of suffering myself, I’ve been lucky enough to gain control over my own pain monster. In my upcoming articles, I am going to write about the weapons arsenal, the mindset and the allies necessary to gain control over the pain monster. You are not alone in this fight. There are millions of patients just like you. Together we are stronger than pain. Pain Patient, CEO & Co-Founder of the free Pain Companion App which is available on Android phones and iPhones. If you like this article, please press that green heart below to help others discover this article too. Stories that share the lived experience of chronic pain opens up the dark space that people living with it experience. This is a collection of stories of resilient action, thoughtful questioning and defiant resistance to the daily challenges that pain brings.